What do you get when you mix improvisation, noise, plunderphonics, big band theatricality, and the mad-dash orchestrations of “Looney Tunes” composer Carl Stalling? Some might say that you get a “disjointed mess,” which would probably be true in most cases. There are ways of making such a diverse heap of ingredients work, however, and the Lisbon Underground Music Ensemble (LUME) has seemingly stumbled upon the recipe. In 2010, LUME released their debut album. With its ever-shifting, fun-house approach to genres, it remains an astoundingly fresh and unique recording. With such indefatigable inventiveness, however, the question had to arise: how can LUME move forward? Being such a progressive-sounding group is a blessing and a curse. On the one hand, there are no expectations and no limitations, and you’re free to switch gears without any forewarnings or fare-thee-wells to the experiments you leave behind. On the other hand, there is often the crushing pressure for a progressive band to actually, well, progress - if you stick around in the same place for too long, you’re bound to get accused of creative stasis. With Xabregas 10, LUME defy these accusations and soar over the heads of anyone waiting with land-locked eyes for them to crash or stall. They don’t do this by ramping up the insanity, however, or layering on more samples, or increasing the rate at which their manic melodies unfold themselves. In fact, they do the exact opposite - they dial it back. They lock into grooves. They open their arms to repetition. Don’t take this as a sign of slowing-down, though; LUME haven’t slowed down so much as become more focused, more deliberate, and more steady-handed in their approach. The album opens strong with “Astromassa,” which owes as much to final-boss video-game music as it does to Frank Zappa’s Uncle Meat. That’s to say: it’s compositionally inventive and occasionally veers off into mad-cap melodicism, but is (at heart) a drama-filled rave-up. 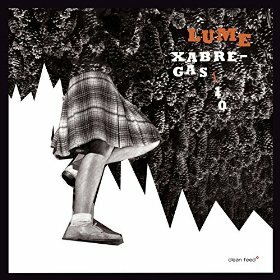 A lot of credit has to be given to LUME’s primary composer, Mário Barroso; while there is a sense of underlying mayhem that sometimes rears its head, the myriad instruments and electronic elements that occupy “Astromassa” are largely kept in-check, wrapping around each other in both precise lines and wild (but contained) zig-zags. “Sandblast” is similarly structured, but replaces the histrionics of the previous piece with something more eminently danceable. The bass-line that drives the composition is straight out of the James Brown playbook, and André Sousa Machado’s percussion is a pulsing ode to Afro-Cuban polyrhythms. Interspersed throughout all this funk are bursts of improvisation, with José Menezes (on tenor sax) and a trombone (although I don’t know whose) both taking wild, energetic solos. “Polén” slows things down a bit, but it’s every bit as exciting as the pieces that came before. Once again, the rhythm section occupies a central role, Miguel Amado’s bass and Machado’s drums providing a solid back-bone for the swirling, heaving waves of sound that the other members of LUME produce. This composition is more indebted to developments of the slow and textural sort, avoiding the twists-and-turns of “Astromassa,” “Sandblast,” and, well, the vast majority of LUME’s previously-recorded output. That’s not a bad thing, though; it shows that they are well-equipped to handle a more restrained approach, and it shows that composer Barroso doesn’t shy away from stuff that might be outside of his comfort zone. At its conclusion, “Polén” gives way to a dense, chaotic wall-of-sound that eventually dissipates, leading to the final piece. “LSW” begins with a vocal sample in Korean, one that marks the return of LUME to the manic, endlessly-allusive style of their debut recording. After that, there’s very little in the way of rest: there are snatches of familiar melodies, snippets of conversation from old television programs and movies, and explosive outbursts from the band itself, all wound together in a tight package that has the kinetic force of a hand grenade. After the halfway point, the composition dips again into the “wall-of-sound” technique that marked the end of “Polén,” but now it’s even thicker and more disorienting. By the time this wall is abruptly removed, the listener is left in an ecstatic daze - not just because of the pyrotechnics they have just heard, but because of the effect of the album as a whole. Xabregas 10 is a glorious mess, and one that I can highly recommend to anyone on the look-out for music that simultaneously batters the senses into the ground and sends them spiraling into space.